The Structure and characteristics of some of those fibres and some tips in how to recognize the potential of that fibre. The CHRISTAN hope is that this might prevent some of the disappointment that can occur when there is a mismatch between fibre and garment. We have started with the wool fibre as this is definitely the most common fibre used by spinners today and through out our recorded history. There are many breeds of sheep developed into agricultural flocks small and large and these have been used through out many geographical regions. This fibre is easily blended with many of the other fibres. Its popularity has wained some what over the last hundred years with the introduction of synthetic fibre but it is still the foremost natural fibre along with cotton and silk but there are many other fibre that are challenging that today. The more we find out about a fleece the better we will be able to judge a suitable use for it. The actual make up of the wool fibre is like that of a fine hair covered in scales when seen under a microscope. Another characteristic of wool fibre is the crimp. Women all over the world like to put waves through their hair, as such, a crimping iron is used to achieve the corrugated wavy hair look. Some call this personal hair styling tool simply a crimper. This is where this word came from, but unlike our own hair which is styled in this way according to fashion and beauty, the crimp in wool gives elasticity and airiness to garments enabling them to be light weight but still warm. Elasticity of the fibre is also indicative of the number of crimps and as a general rule, the more crimps the more elastic the yarn. The Staple is an individual lock of wool and its length determines the type of spinning for which that fleece is best suited. Long-staple wool’s are generally suited to worsted spinning while short staple are suited to woollen spinning, but this is not necessarily exclusive to each other. The tips of the staple are indicators of how much damage the weather or climate conditions might have had on the fleece. If there is marked tipping, this indicates that the fibre end may have been damage and is broken unevenly an animal with a nice dense fleece will have less tipping and damage than an animal with less density in coverage. You also need to be looking for the hairy fibre that is sometimes present. This fibre can have a number of names, kemp, hair or medullation. Basically it is a hair that is hollow not like the woollen fibre, it is scratchy or itchy when worn next to the skin. It will not dye easily so will be noticeable in coloured garments. These fibres need to be removed in skirting the fleece or with preparation for spinning. Fibre size today is indicated by the micron measurement (one millionth of a metre). This measurement replaces the old count method. If you buy wool already measured, remember the two systems work in opposite ways, the higher the count the finer the wool the lower the micron the finer the wool. It is important for spinners to recognising for themselves the diameter of the fibre. 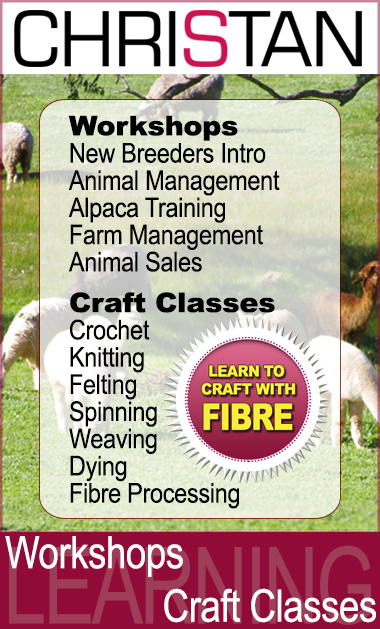 CHRISTAN classes start from the very beginning for absolute beginners, or join some of our more advanced Craft Classes. EQUIPMENT – Use selected spindles to spin yarn Introduction to the spinning wheel. 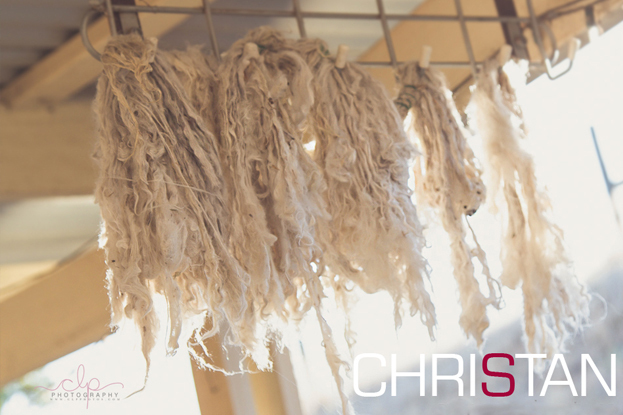 FIBRE PREPARATION – The process of washing fleece. Teasing and carding wool for spinning. MAKING YARN – Spin using primitive methods. Spin on spindle. Introduction to the spinning wheel. OCCUPATIONAL HEALTH & SAFETY – Equipment safety. FIBRE – Sort the fleece into sections. FIBRE PREPARATION – Blending fibre. MAKING YARN – Spin singles on the wheel. Basics of Plying. OCCUPATIONAL HEALTH & SAFETY – Manual Handling and transport of equipment. FIBRE – Care of finished product. EQUIPMENT – Identify basic equipment problems. FIBRE PREPARATION – Determine preparation methods for individual projects. MAKING YARN – More Plying – Novelty. OCCUPATIONAL HEALTH & SAFETY – Be ever vigilant. Spot the hazards.